Hanuman Chalisa is certainly the most common religious text/chant while Hanuman is one of the most popular Deity in Hinduism. Each one of us has heard the Hanuman Chalisa once and most of us remember at least a few chaupai from it. 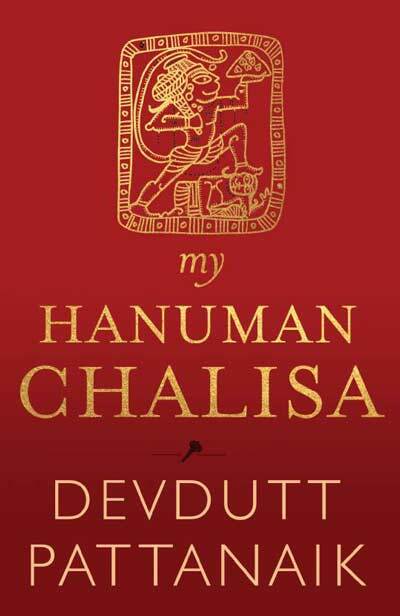 Devdutt begins the book by telling why he decided to write this book: my Hanuman Chalisa. Obviously, because, it might be a small chant of forty plus three verses, the book in itself contains a universe. No doubt, it’s the most popular religious text. Devdutt wanted to explore the same. The curiosity to know what makes this text so popular and so reliable, as people connect it to their protection, growth, and wellbeing. Hanuman Chalisa itself was written over four centuries ago by Tulsidas in Awadhi, an old dialect of Hindi. Each one of us has heard the chalisa at least once in life, however, have we ever really sat down to realize what it actually means. Now, what’s most lovable about Devdutt is that he writes for the common people. His language is simple, easily comprehensible yet appealing. It is not a masterpiece of literature, but a book to make them realize the importance of Hanuman Chalisa, connect to it and the deity behind it, Hanuman. I don’t think there could have been a better explanation. As Devdutt explores the Hanuman Chalisa verse by verse, we leap into a vast ocean of universe, called Hanuman. We learn who Hanuman is, what were his feats, what were his ideologies, and what is his relevance in the modern world. Modern world, yes, one because the chants gives us strength to deal with the demons. Either the mythological demons, or our own demons of the past (and present). Two, because, it is believed Hanuman is still alive. His role on this earth is not yet over. The only reason he is considered as one of the Chiranjeevi. When I started the book, I was expecting a detailed translation. However, it turned out it was much more than that. In every chapter that focused on a single verse not only contained the translation of the chaupai in a simple language, but it also explains the story behind it, along with other relevant stories, philosophies and awesome spiritual or self-improvement tips. It evident that the author has done a tremendous research while writing this book. He has dug upon a lot of mythological facts not only from Hinduism, but from local variants from various parts of India, from Buddhism and associated foreign cultures like Thai, Chinese, Malay. Well, I always believed Monkey King from Chinese stories was none other than Hanuman. Devdutt has only reinforced my view on that. Other than that, I also got to learn a few stories associated with Ramayana, which I never knew. I would totally recommend my Hanuman Chalisa by Devdutt Pattanaik to all the lovers of Indian Mythology, all the religious people out there and anyone who cares to know more about Hanuman, or want to improve his/her lifestyle by adopting some excellent philosophies associated with the most popular Hindu Deity.